For months I've been having trouble answering the question of why I dropped out of yoga teacher training. I did one weekend of the training in October, and then by December -- before the second weekend -- I knew it wasn't right and had to bail. Each time I've answered the question of why, I've been stunned by how many things I wanted to say in response, in a jumble, in a rush, and yet nothing really quite captured the Why of it. I've been observing that and marveling at it a bit. How funny that something that I knew 100% clearly to be the right course of action should have such murky motivation. Or maybe the question should be why I signed up in the first place. It seemed like the next natural, logical step, particularly in a year when I was pursuing so much yoga in so many places. And because I LOVE yoga, everything about it. It makes me happy and I love sharing what makes me happy. It's what I want to be engaged in all of the time, playing on the mat or off. It seems like the Big Truth of life -- I just want to stay inside it all the time. And probably there was a little ego involved, since last year my sister completed teacher training. I had dreams of our shared studio or shared retreat somewhere - what a great thing to be able to do together! But it didn't work for me. Teaching yoga is super-hard and I love a challenge, but I just found myself dreading the second weekend, exhausted by the number of plates I had in the air. Dreading it. Which is really not the emotion you want to have, which is not an emotion I have ever had when it comes to yoga. Which is an emotion that all of 2010's efforts and resolutions were designed to eliminate from my life. The teacher was stellar, the group varied and inspiring. And yet, there it was: dread. I felt a little let-down by my own self, yoga school drop-out. 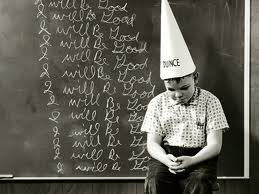 Dunce-capped. Lame. What was my deal, anyway? In classic break-up lingo, it's not you, teacher training. It's me. I dropped out because teaching yoga in this model, I now finally realize, is not me. I love yoga -- I love to practice and talk about it and, mostly, I love to write about it. And I spend a lot of time writing about it, some weeks maybe even more time than I spend on the mat. Because writing is what I do. Writing is who I am. So I'm good now. If asked again, I know the answer -- short, sweet and to the point. It did get easier. Having to verbalize all that I love about yoga and how it makes me feel took my practice (and of course, myself) to a whole new, beautiful level. I am just glad that I got to spend that first weekend with you! It certainly made my transition so much sweeter.